One Of The Top Six… In The World! I learned one thing this week. Never take your old family photos for granted! I’ve always had this photo in a box, somewhere. It is my grandma, Lillie and my dad and we always called it ‘The Grumpy dad Photo’. 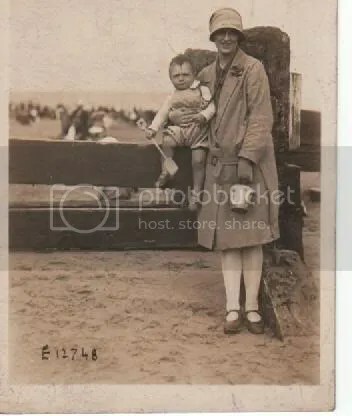 I’d assumed it was taken by my grandad, Billie, and thought nothing more about it – just a typical seaside shot. 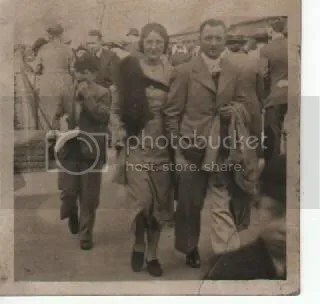 Dad was born in February 1926, so this image was almost definitely taken in 1926. Go back 18 months or so from this, for a minute, though. My grandad, Billie, came home from World War One a few years before, and was one of the only men of his generation for streets around. He could have his pick of the women. And dad used to tell me, Grandad said he chose the girl known then as the most beautiful woman in Leeds. So the photo comes from a photographer, William Foster Brigham, considered to be one of the top six photographers … in the world, as Clarkson would say. And there was I, assuming it was just a snapshot taken by my grandad. Of course, chances are it was by one of Foster Brigham’s employees not the man himself. But still. From now on I’m determined to think of it as a photo by one of the top six photographers… in the world. [Visit to Winchcombe’s 16thC factory, quoted in ‘The Spinner’s Workshop’ by John Mercer]. Meaning it was made from a mixture of virgin wool and waste recycled woollen rags. His father owned a dairy – nothing to do with wool! Leeds people (‘Loiners’) could do that, spot shoddy on sight. Touch a coat and know instantly if it was wool or something masquerading as. Over the 27 years or so I’ve been spinning and dyeing, I didn’t realise it til recently, but I’ve probably developed a similar instinctive knowledge when it comes to my sense of touch and wool. It comes with time and practice. Also you have to reach the point where you’re confident in your own abilities! 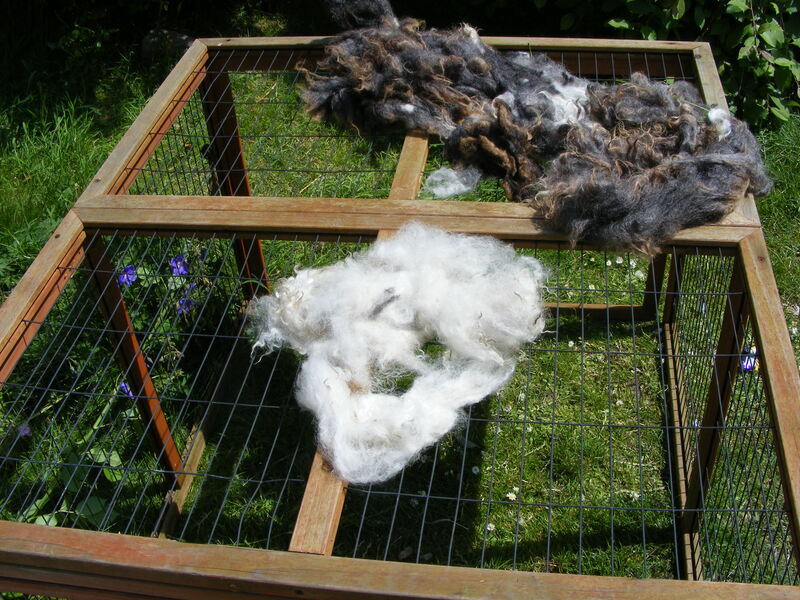 Here’s how I sort a fleece. I learned this from books years ago, in the days before YouTube, etc and when books that covered wool sorting for handspinners, couldn’t afford to have many, or colour, illustrations. I sued to sort a fleece with one book or another open at the woolsorting chapter, propped open nearby. I forget when I was suddenly just wool-sorting, without reference to anything but touch and sight. 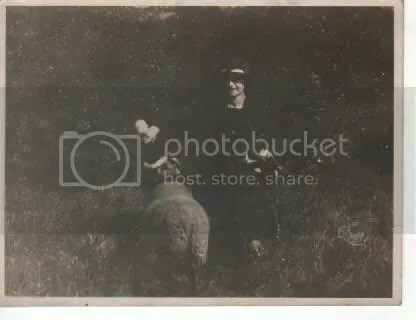 Above: My grandma, Lillie, with a lamb she met at a relative’s farm. She adored this sheep so much she kept a lock of its wool. This would be 1926. I still have it upstairs! 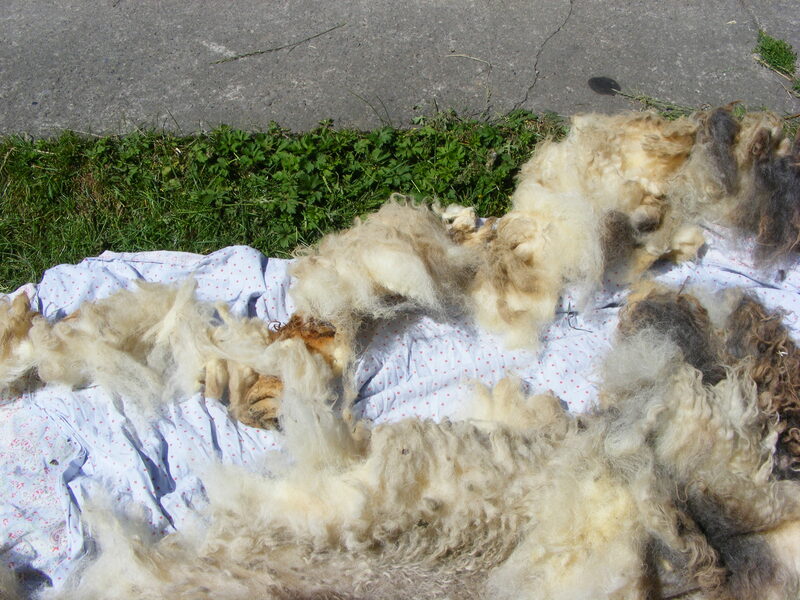 Yesterday was a suitably hot and sunny day – ideal for wool sorting/washing as you can do the whole process outside. Owt for nowt as my dad and grandad would have said. 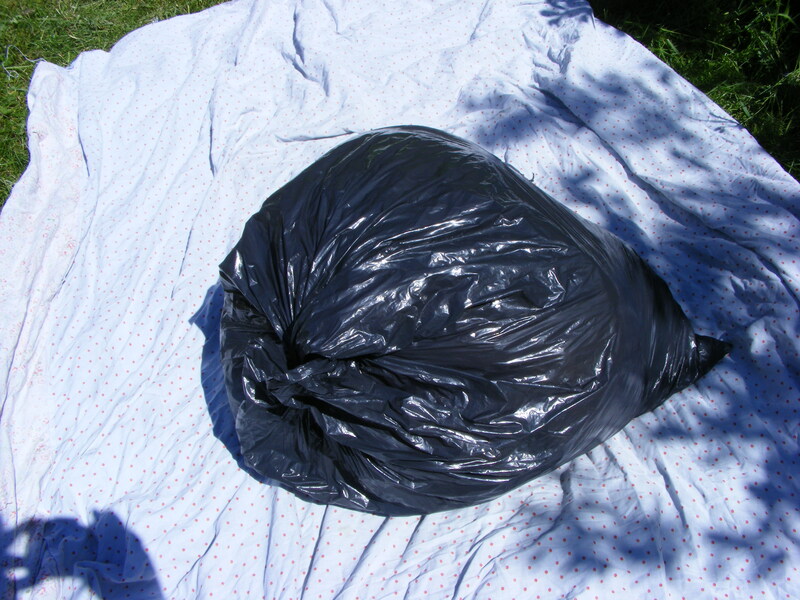 First, despite the grass being dry, I spread an old duvet cover on the lawn. 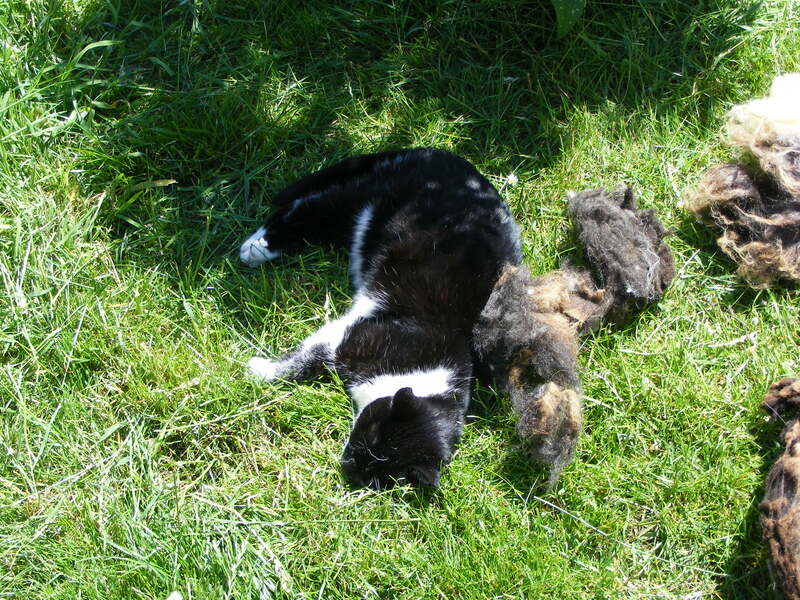 It’s bad enough teasng the farmer’s vegetal matter out of some fleeces – so I’m not about to add my lawn clippings! Yes you’re not meant to keep fleece in polythene. But yes, I do. Bad girl. It’s OK if you poke a few holes in it and don’t leave it in there too long. Once it’s washed it can go into old pillowcases, though. The hardest part of sorting can be unrolling the fleece. Whenever I have messed this stage up – or the shearer rolled it badly – it has always ended in tears. If you can try and unroll your fleece to keep it as intact as possible, the shape of it will help you, and give you clues as to what’s where in terms of wool grades. Sometimes (usually in fact), they tie the whole woolly bundle round with the neck wool to secure it. In this case, it was secured without a long ‘tie’ of neck wool, but if it is rolled this way be very careful undoing the ‘tie’ as some of that can be your best wool of all! Here’s the roll partially undone. 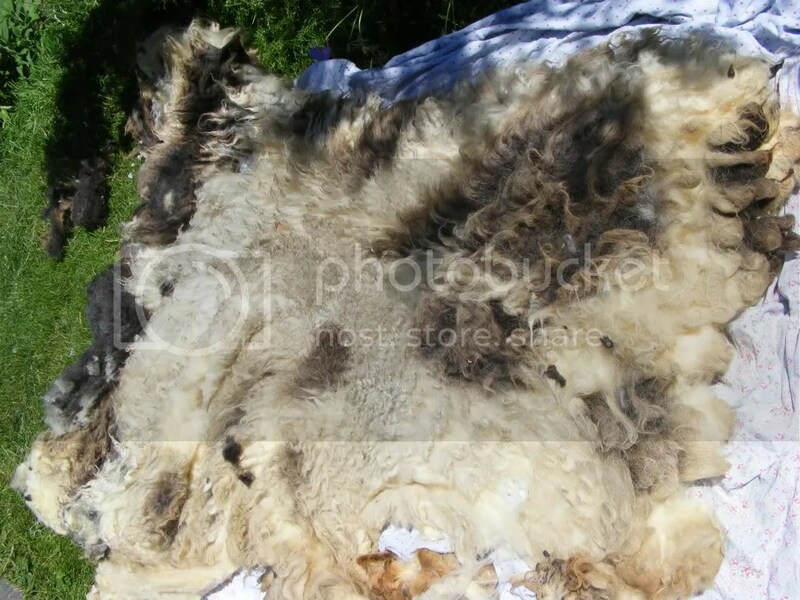 Notice you can differentiate from the sheared (underside) wool and the tips. This is another clue to help orientate you, whilst unrolling the fleece. 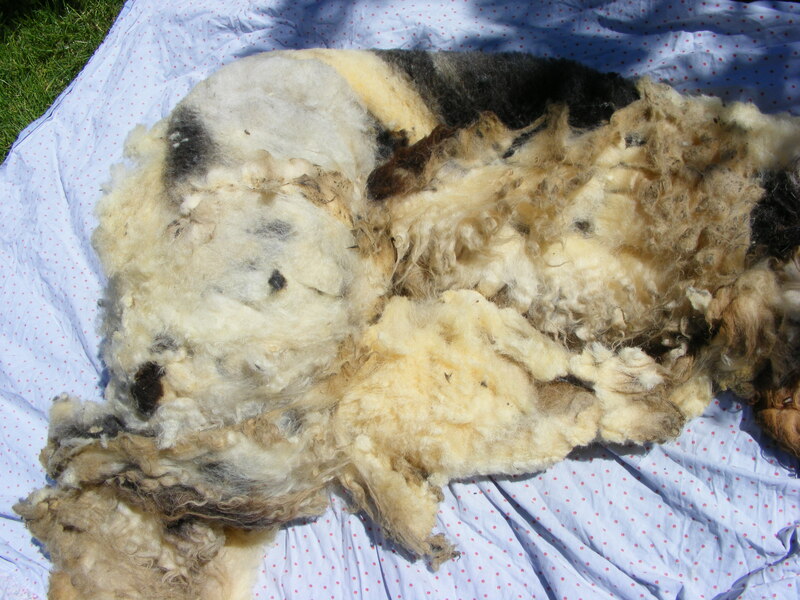 The fleece should be rolled up so the belly wool is either side, and wool from the sheep’s back will be in the middle of the whole fleece, once its rolled out. It will be obvious fairly soon which end is neck and which is rump. The neck wool is usually a long piece. Follow the smell for the rear end! Sheep are filthy things so you will probably find poo the entire length of the belly, both sides. Because this is a bi-colour fleece, I now have a decision to make. I can sort for colour, or can sort for quality. Or… I can sort for both! Looking at it, this sheep’s markings meant most of its grey wool was close to the neck (best quality wool), but looking at it closely, it was of different qualities, but there is no really poor wool up at the neck end, where it’s grey. I have no project in mind yet – if I had, then the decision would be made for me. Want to make a shaded jumper like this from Jacobs? You have to sort for colour depth first, staple (wool’s) quality second. So I decided to separate the largest ‘blob’ of grey from the rest, then just sort the rest for its quality. I can blend all the varying qualities grey seeing as none are spectacularly fine staple, and none terribly coarse. When you separate off the wool, notice staples (clumps of wool) grow in lines or rows almost. Use this to your advantage and separate gently between the ‘rows’, when you can. If you have a self coloured fleece though you will never have to think about this! All you’re doing then, is sorting into 4 or so broad qualities. For a first attempt I’d try a sort of medium-ish length stapled wool (Say, Cheviot – which also has the advantage of being all one colour). Now, woolsorters of old had enchanting names for different qualities of wool to be found within a single fleece. ‘Britch’ and ‘”skirtings” and “back” for example. But over the years I have just dropped all that (much as I love the idea of it!) and gone with 1, 2, 3, and 4. 4 is the stuff I’m going to ‘skirt’ off and not even bother with. 1 is the prime, finest, best quality stuff. Usually you find the majority of a fleece will be 2. Up around the shoulders and neck, you might get 1. But look carefully as it may be elsewhere, especially on the flanks. Watch out for one side being slightly more felted/raggy looking than the other. Like people, sheep often sleep on one side. The side she has slept on the most, is the more damaged one. It’s the (b) we’re worried about here. Sometimes if the sheep isn’t so filthy, you may have to lose a lot less to the skirting. You can sometimes buy a fleece already skirted, too. That is more likely if buying from a small handspinner’s flock. I use the rubbishy wool as mulch on the garden. If you’re frugal, you could wash it and use it as cushion stuffing, or doll stuffing, or felt it. If you’re more frugal than me you can wash and re-wash til you get the poo out, then sort it into your main categories. I am now going to sort the remaining fleece into 3 categories. 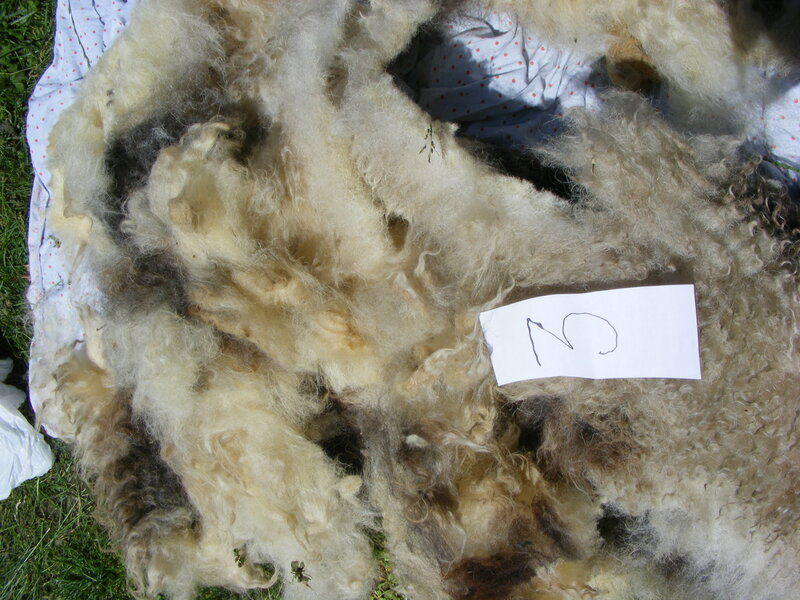 This is what 3 Wool looks like – coarse, and not so crimpy (wavy) . It’s worth taking a closer look at wool from all 3 types – pull out a lock, snap between your fingers. If there’s a break, the wool may appear sound but be weak and snap when you pull. Due to the sheep’s illnesses, or being out of condition at any point prior to shearing. Also look at the tips. (Opposite end to shorn end). If they look brittle and fragile – you may be wise to cut them off – if you can sacrifice that length of staple. But it could also be a sign of an out of condition sheep or wool that will never be fantastic whatever you do (silk purse, sow’s ear etc etc). 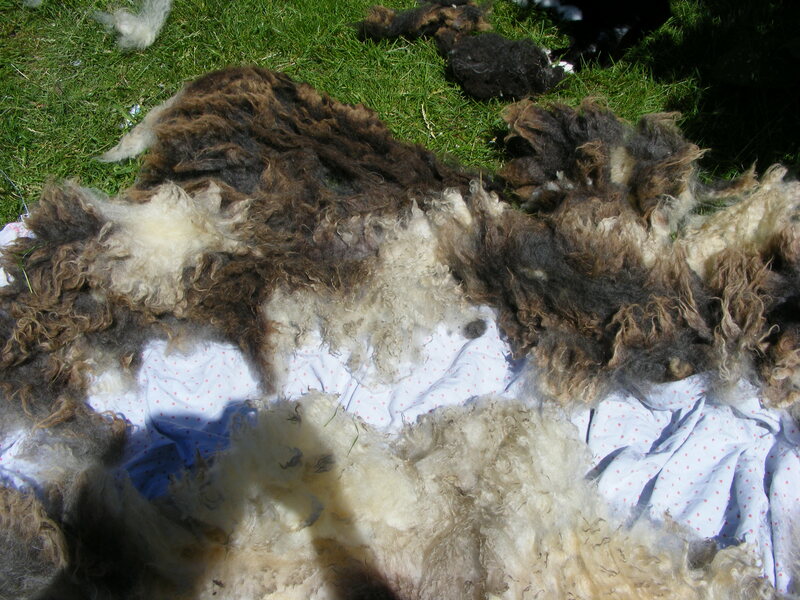 Hogget (first clip from year old sheep) fleeces are a bit more reliable quality wise as for the first shearing the sheep will produce the best fleece it is ever likely to, and less prone to be coarse or have breaks. Kempy wool isn’t great either as it’s scratchy and the little hairs may work free after spinning. Not only potentially itchy but they may abrade the finer fibres and after a few washes your pretty skein of handspun will look unbalanced and…weird. Looking at this fleece, only Category 1 wool was unkempy. It truly isn’t a great fleece. But it will do. 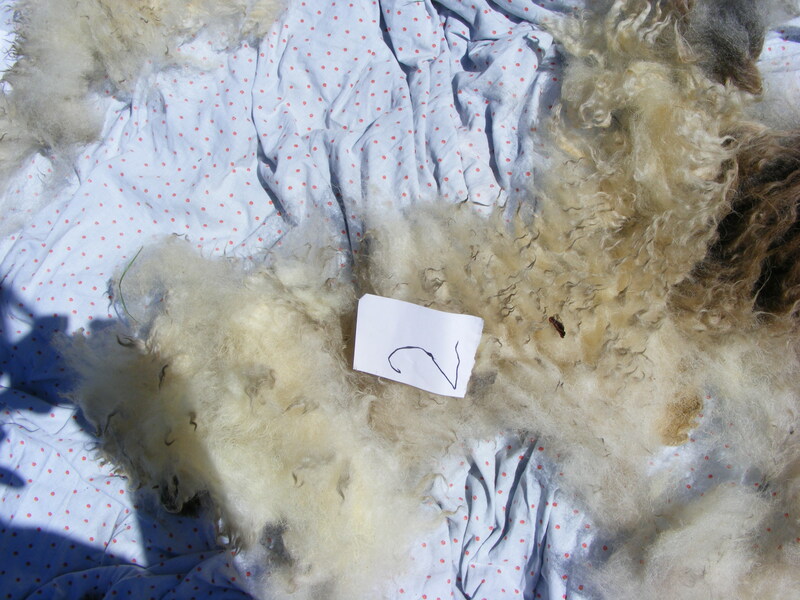 I find it easiest to spot the ‘worst’ wool first and sort it as sometimes 2 and 1 are harder to differentiate from eachother but often the 3 Quality is very obvious – so get that off, then you can concentrate! 3 may be useable if blended with Category 2 wool. Or you could use it alone for a specific purpose. In the Dales, they’d sort wool into ‘leggings’ and ‘footings’ – using the coarser stuff for the feet. Again, a lot of your decisions will depend on final use. Eyeball the fleece closely and start to gently pull apart at the points where you think the 3 Quality wool adjoins the better stuff. Again, notice the natural lines the staples have and work with it, where you can. Again, common sense helps – if you think about it, the ridge of the sheep’s back is the most exposed to the elements. This will often be amongst the coarsest wool. Its flanks might not be so bad. 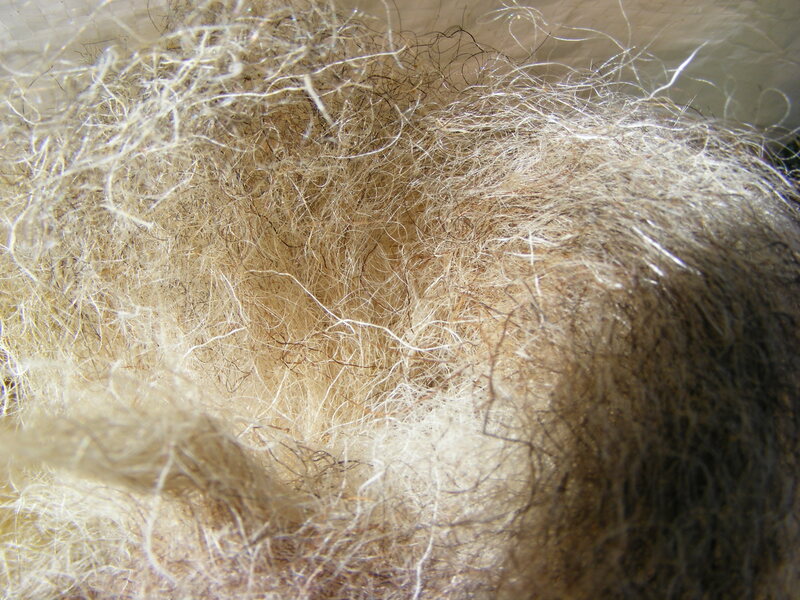 And finally, the 1 wool – some of which was mixed in with the grey I had already separated off. As usual, all the best wool on the animal came from around its neck and shoulders. This wool was finer, and more crimpy. Finally, I separated my 3 piles of wool into 3 bags, each with a label. 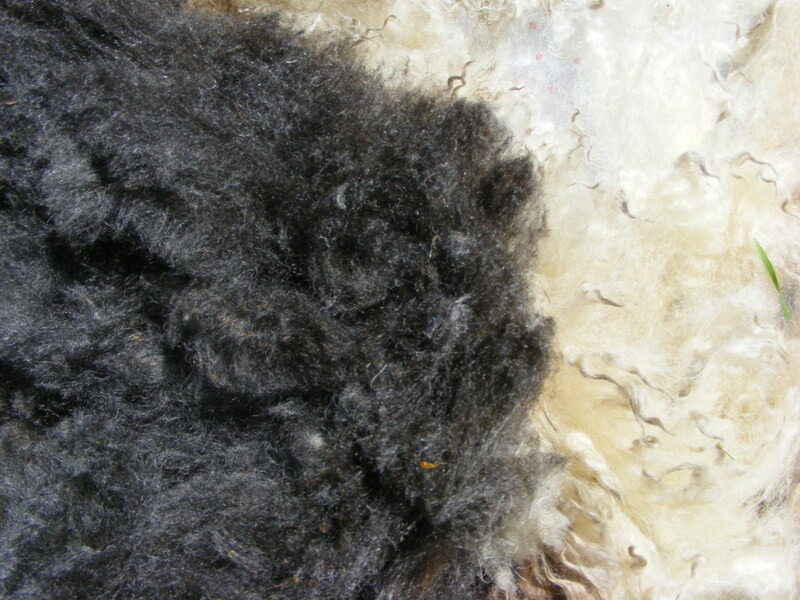 This fleece is unusual in that it had the tiniest amount of Quality 1 wool I have ever seen – ever on any fleece. Ever. Jacob’s is rarely fantastic anyway. 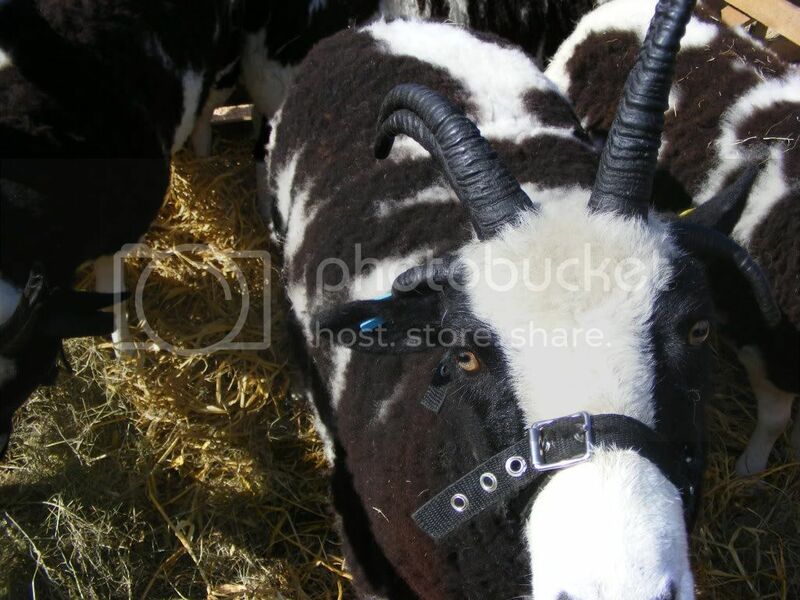 Unless you go to the Masham Fair or a similar show and buy it from a prizewinning wool sheep that looks like this, of course! Handspinners’ flocks will usually give you a better shot at decent Jacobs, too. 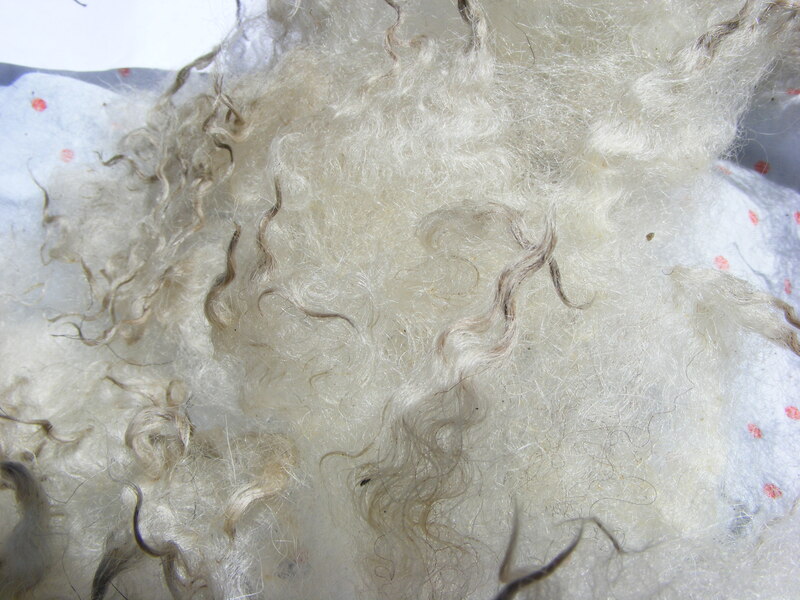 I don’t even know what to do with it yet but – given the sunny day, was ideal fleece drying weather so I scoured the grey and the 1 Quality straight away. 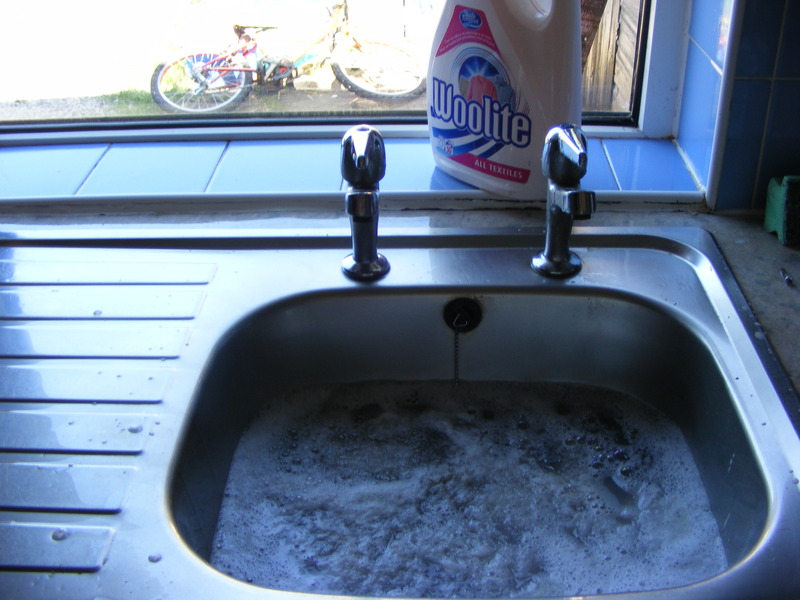 ‘Scouring’ is the traditional term for a thorough wash. Basically hot water + detergent dissolves the grease, sheepy sweat (“suint”) and dirt. ‘Washing’ meant just quickly dipping the sheep before shearing or the fleece after, in running water. I’ll talk about scouring some other time. 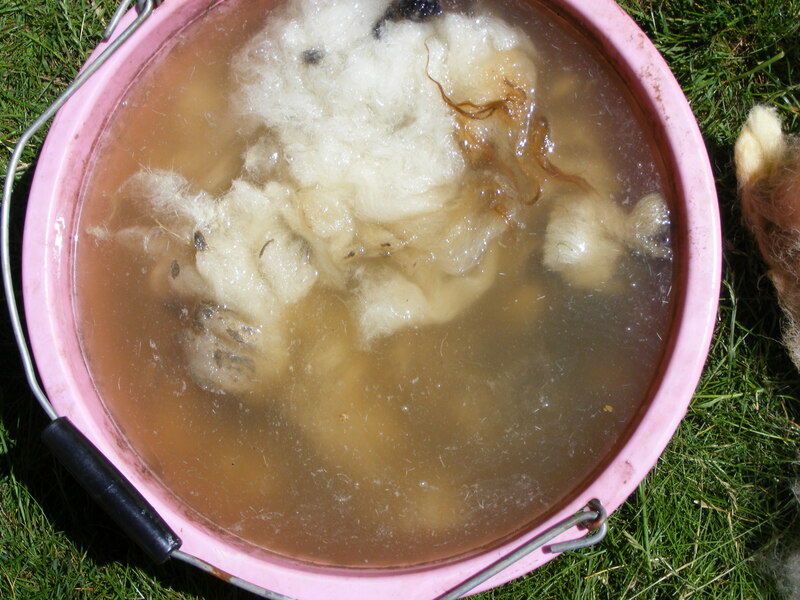 I try to do all my fleece washing and drying in the summer/early autumn if I can as it’s quicker to dry but also if you leave fleece in the sun for a few hours, it kills some ‘baddies’ like leptospirosis. Not a risk with this fleece as it was only sheared the other day and came straight to me in that bin bag – but you can’t account for the good or bad storage habits of others. Not just that, but sorting wool outdoors in the sunshine is easier than stinking up the house with it, and the heat of the sun makes the greasy fibres slide apart more easily, as you sort. 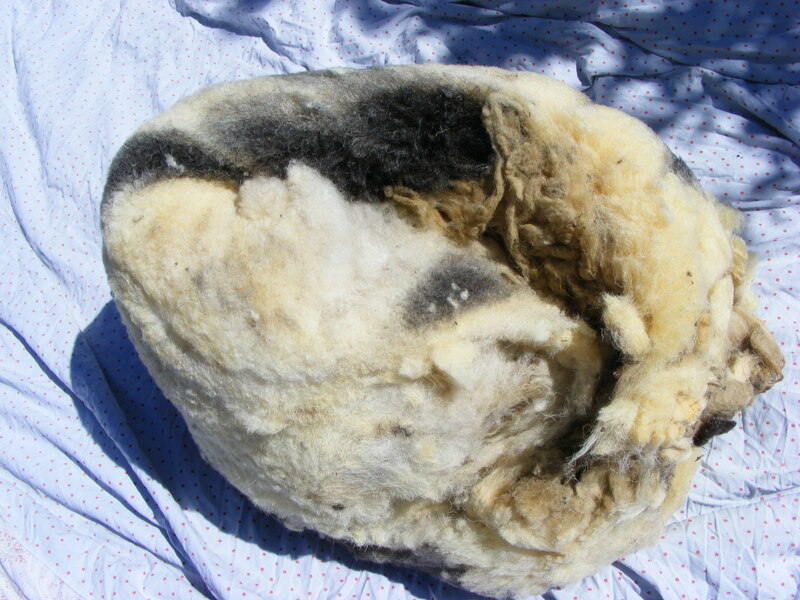 Wool was traditionally dried and bleached in full sun. In 19thC Haworth, they dried clothes over the gravestones – quite a common sight in rural areas, too. Vicars would moan about it. At earlier dates, the wool factors would also hang woven cloth for sale over church walls – often simply the biggest available ‘viewing space’. This led to the building of Piece Halls like the one in Halifax, where pieces of cloth could be displayed to best advantage, for buyers to select. ETA: Since writing the above, over two years ago, I recently discovered my Huddersfield clothier ancestor, Thomas Smith. At one point, he was a ‘Fancy Wool Manufacturer’, sharing a mill in Longwood, Huddersfield with the well-known Hansons. In 1846, he was made bankrupt and as an elderly man, in the censuses, no longer a clothier or mill-owner, Thomas is listed as “wool-sorter”. It must be in the genes. Wondering about the discussion elsewhere re. fancy sheaths, I had a quick trawl of the 19thC Newspapers archive from the British Library. Middleton-in-Teesdale Floral, Horticultural, and Industrial Society held its fifteenth annual exhibition on Saturday afternoon…. The winner was Thos. Anderson of Harwood. That ‘ornamental’ suggests some indeed were just made for show. Meanwhile, The Sheffield and Rotherham Independent, Nov 1871, describes a Hospital Bazaar at Rotherham (South Yorkshire) where offered for prizes are “German silver knitting sheaths”. 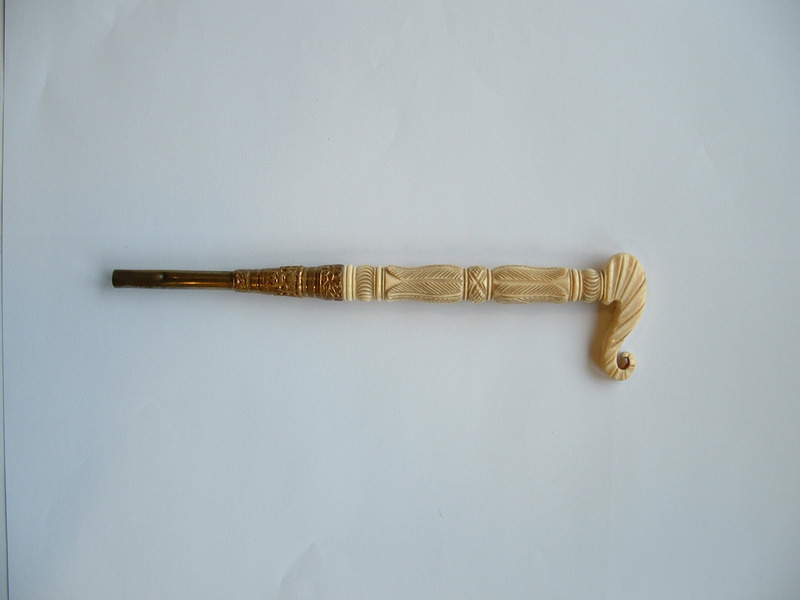 … Mr Ferguson, F.S.A., produced a large collection of knitting sheaths from the Wigton district, Cumberland. These archaic-looking instruments were much commented on, and the chairman pointed out the resemblance of sum of the form of knife on the mithraic scultpure at Newcastle; while Mr. G. Wright., F.S.A., drew attention to their analogy to the Persian creases…. Just to make life more complex, I just checked 1891 to see if the Humphries were still at 52 Seymour Place. They live with a nephew, neice and servant. Free BMD tells me Mary Ann Humphries of the right age, died in Marylebone in the last quarter of 1889. So it looks like Robert was newlywed close to the date of the 1891 Census. A Robert Humphries married Flora Gillies in Marylebone district, in the last quarter of 1890. You’ll be relieved to know, that’s my sleuthing done for today! 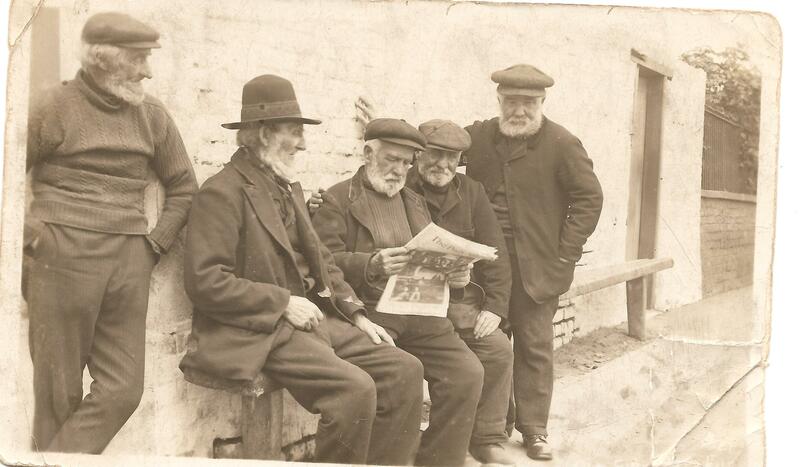 I did spare a thought for these lovely gents, photographed at the Cliff Top – although I’m not sure exactly where this is, as apparently much of the older buildings in Filey were demolished in the 1960s. 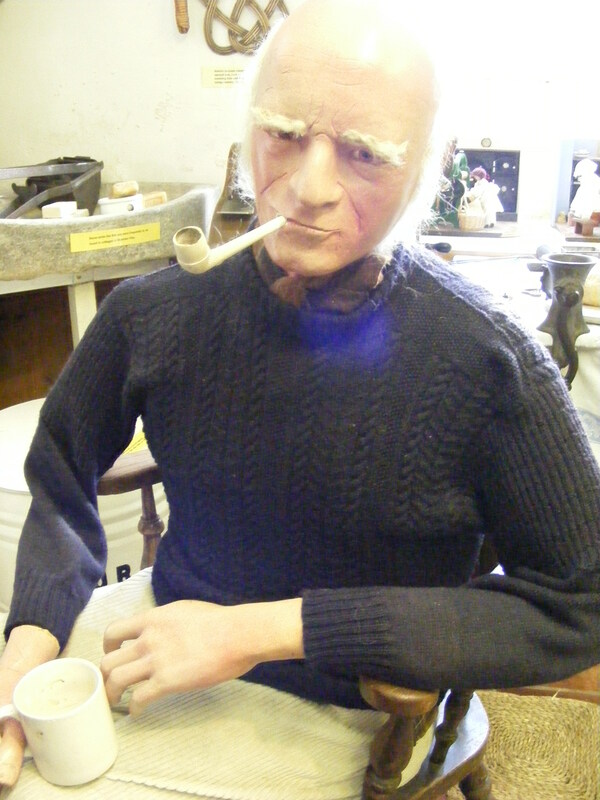 "Bert lost the gig modelling for 'GQ Magazine' because they said he was too 'wooden'..."
And there does seem to be emerging a generic Filey-esque gansey pattern but with some variations, of course. More of which at a future date, after I’ve charted and documented all I can! Since around WW2, this has been done by tractors. Used to be horses. And finally, back to the car up the Ravine, and a slight detour to St Oswald’s church to search out mariners’ gravestones. (Morbid I know but it appeals to the genealogist in me). Monumental masons in coastal areas do seem to have had a more…pictrial approach than some of those inland, that’s for sure. I hope descendents of these mariners don’t mind me doing this but I like to document what I find and better still, share… Here’s a couple. 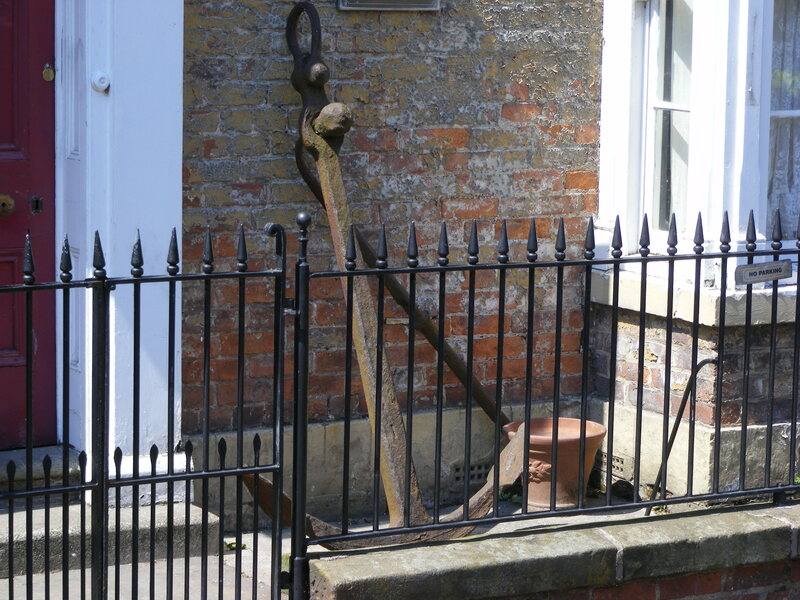 We found a efw ‘Lost At Sea’ memorial inscriptions and some where they appear to have died in old age or on dry land, but have an achor or sextant carved on the stone to record the fact they were mariners. 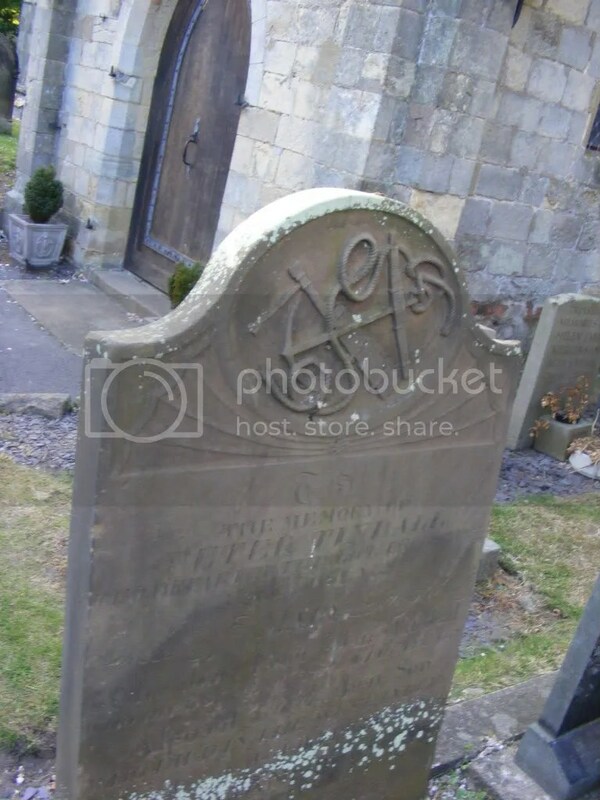 It looks like Edward and Elizabeth were predeceased by their son, John W., and the inscription of a date for him is too worn to read, but it appears to say he was 22 years old. Moving back through time, in 1881, Elizabeth can be found without Edward, in Filey, recorded as ‘Married’ and with ‘Fisherman’s Wife’ written and then crossed out, by her name. Her age is given as 50. This looks likely to be the same Elizabeth. She is living with her children; Jane, aged 13; Sarah, 11; and son, 6 year old Edmund Sayers Cowling. All the children were born in Filey. Her mother in law (‘Bertha Sayers’ in 1891) is here down as ‘Bothia Sayers’, a ‘Fisherman’s Widow’. They live at Reynolds’ Yard. (‘Yard’ usually denotes tenements). Sayers appears to be Elizabeth’s maiden name. Meanwhile in 1871, Edward was onboard ‘The George Peabody’, a 40 tonne cod fishing ‘Dandy’ out of Hull. On the Census night, it was docked at Grimsby and crewed by five Filey men. The Census has given us a birthdate for Edward around 1833, and sure enough, IGI confirms an “Edward Cooling” was baptised 4.2.1833, in Filey, son of John and Helen. 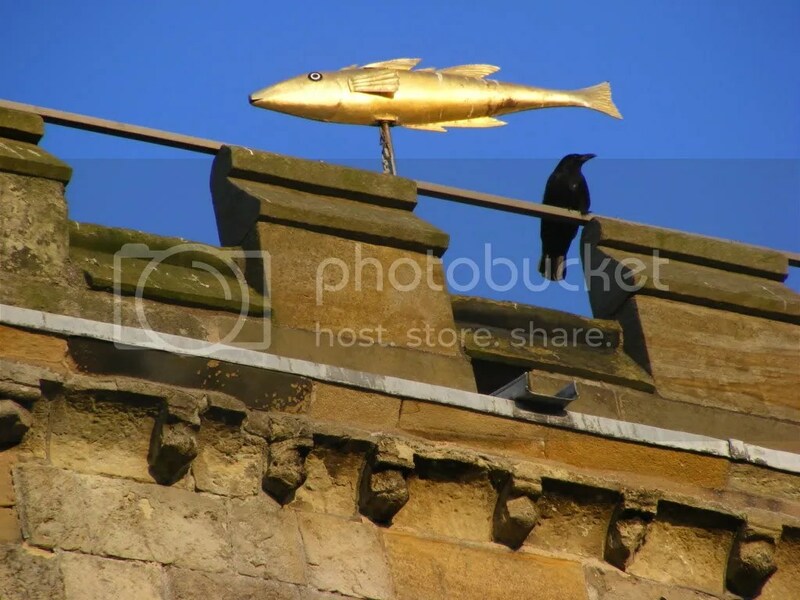 Certainly 1871 saw Edward on a vessel – the ‘Sarah’, out of Scarborough, listed as a ‘yawl in the fishing trade’ and docked at Albert Docks, Hull on the night of the Census. Edward was listed as married, a ‘Mate’ and age given as 28, birthplace Filey. 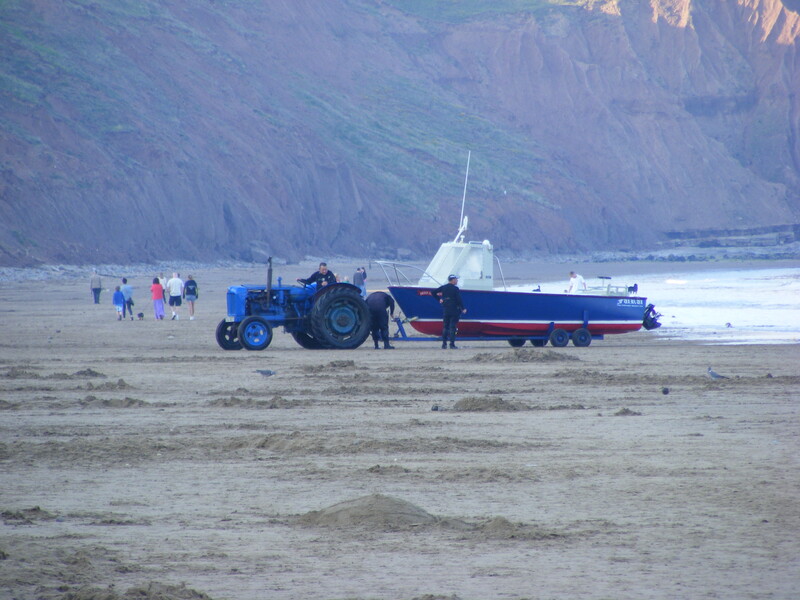 The crew of 5 are all from Filey. 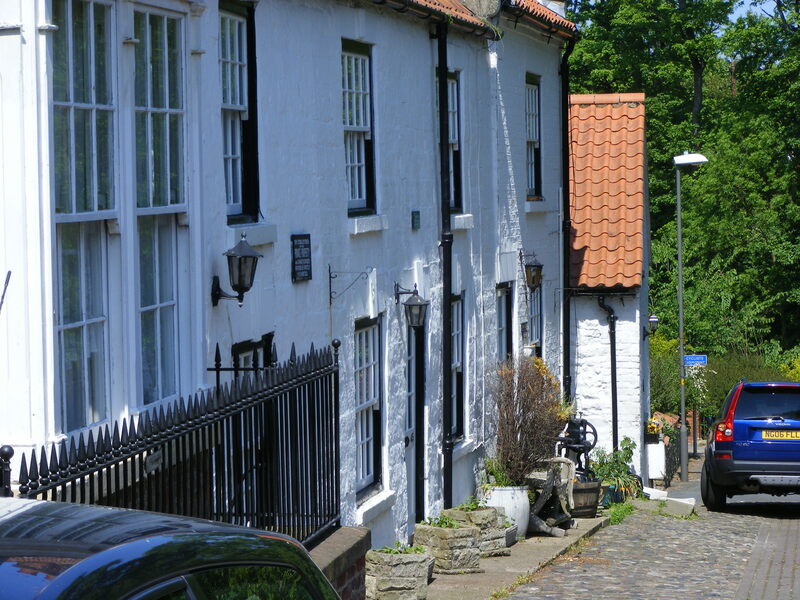 Travel back another decade in time to 1861, and Edward is at home in King St, Filey. He is 28, married and born in Filey so this is our man. But… wife is Margaret also 28, also born Filey. They have only one child, Elizabeth A., who is 2. This suggests our John W., may not have been born yet and may be a child of the first or the second marriage. Realising Edward had remarried at some point between 1861 and 1881, I had to go look for the wife in 1871. For this date, I couldn’t find a Margaret but did find Elizabeth, 38, married and living at Mariners’ Place – another tenement (the enumerator had written ‘Yard’ then crossed it out). Along with Bothia Sayers (born Staithes), step-daughter Elizabeth aged 12, daughters Mary Jane, 3; and Sarah, 6 months….. and son John, 4. All born Filey. It looks likely that this is ‘our’ John buried at St Oswald’s. He must have been born in 1867 0r 8. Meaning Margaret died between 1861 and 1867. I have no marriages for Edward, either to Margaret or Elizabeth on the IGI. Not too surprising, as post around 1840, it gets more patchy and erratic. Plus it’s more than possible they were non conformists anyway – if churchgoers at all. I drew a blank for his marriages on Free BMD as well. Free BMD gave me a John Cowling born in Scarborough district, in the second quarter of 1868. (I will check out the Bishops’ Transcripts of the Filey parish records when I get a chance). If John died aged 22, he must have died around 1890. 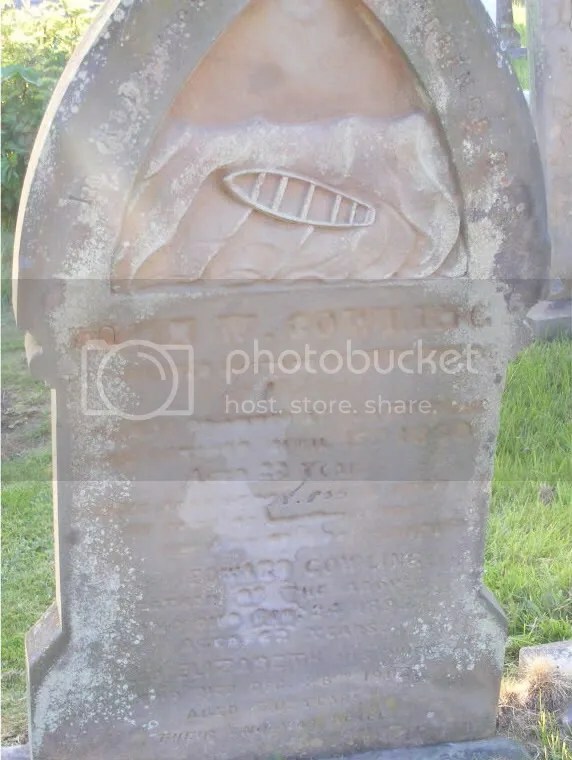 The date on the gravestone is hard to make out, but certainly it could well be 1890. Bothia Sayers would have taught her daughter Staithes patterns, so we can guess Edward and John may have had ganseys showing this influence. I wanted to find Elizabeth Sayers in 1861, when Edward was still married to Margaret. Sure enough she was at Moon Place, Filey, with her parents, John Fisherman, and Bothia. Interestingly, her surname was Elizabeth Lane, – she was a widow. So it was a second marriage for both Edward and Elizabeth and John was the child of that second marriage. She had a son, Robert Lane, aged 5, so she had been widowed in the past 5 years presumably, in 1861. In the 1851 Census, Elizabeth is only 18, not married yet and living with her parents, on Queen Street. 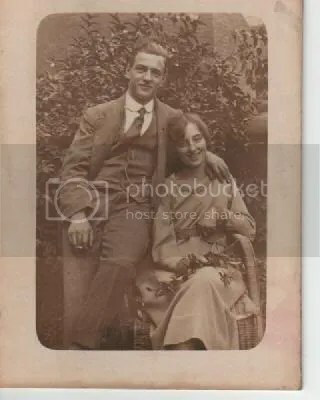 Edward’s parents are still alive in 1851 and the 18 year old Edward lives with them – John and Ellen Cowling (assuming that ‘Ellen’ is interchangeable with ‘Helen). 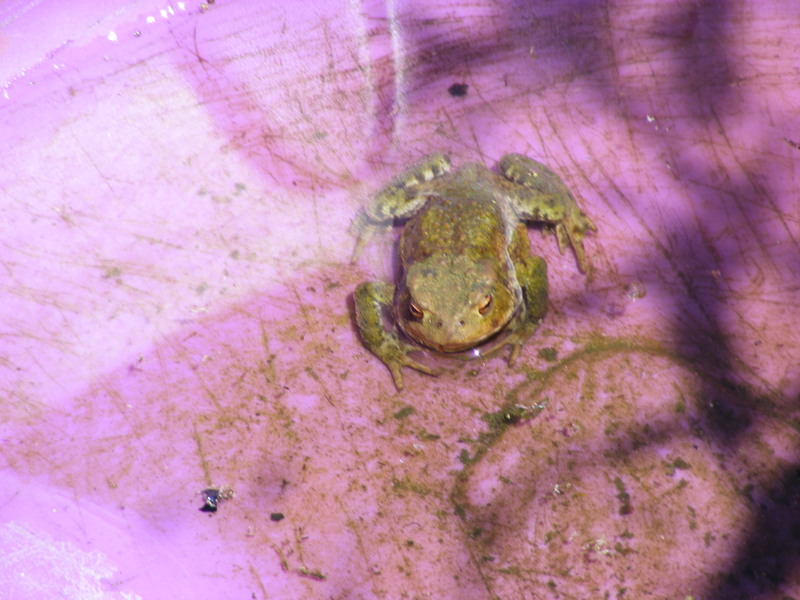 He is a 42 year old fisherman, living at Stephensons’ Lane. If ‘our’ John Cowling died at sea in 1890, it looks remarkably like a great uncle, also John Cowling, and an uncle, died in 1844. Proof – not that it’s needed – of the terrible risks these men took, and their absolute bravery. Knowing this, I couldn’t resist having one last look, for the Cowlings, John Sr and Jr, in 1841. On Stephensons’ Lane still, there they were. John and Ellen (Here ‘Eleanor’ which suggests the IGI’s ‘Helen’ is inaccurate). With 8 year old Edward. The IGI gives us a 1.5.1808 birthdate for ‘John Couling’ of Filey – parents William and Dorothy (which means the John that died in 1844 is most likely John Sr’s brother). A William Cowling is born in 1778, to a Thomas Cowling of Filey. and a John Cowling born in 1772 in Filey also to a Thomas Cowling. It looks likely they were brothers, and the William who was the great grandfather of John Cowling who died in 1890, is the brother of the John Cowling who lost his life in the harbour at Scarborough, in 1844. The words ‘DROWNED AT SEA’ are just legible on John’s gravestone. It looks like he shared the same fate as a great uncle, and uncle. Sadly, my own inland mariner ancestors have no surviving memorials. Which is what impelled me to uncover just a little more of the story behind this weatherbeaten stone – before its story is as lost to the salt air as John was lost to the sea.